When short track fans first heard of the announcement today that Eddie Flemke and the #79 Hillbilly Racing team split up just a few weeks before the start of the NASCAR Whelen Modified Tour season, everyone starting buzzing. Why would one of the most successful groups in all of Modified competition split up after a career season for both parties? Last year, Flemke finished as the runner-up to Tony Hirschman for the Tour title after their battle came down to the closing laps of the season finale at Thompson (CT). The driver and team had won 13 times together over the past seven seasons. This did not look like a combination that was on the outs given their on track success. The answer is that there is no simple answer. The team was like a family and just like any failed relationship, nothing is easy to explain. Speed51.com talked to both parties and found out that there are a wide range of emotions floating around – sadness, regret and even hope. But one thing is for sure: both sides have no interest in throwing mud at each other. “Eight years ago, we planted a seed and watched it grow,” said Flemke. “Last year, we were finally able to taste the fruit from it. “It will definitely be tough,” said crew chief David Hill. “It will be very unusual talking to someone else on the radio now. We got to the point where I knew what Eddie was thinking. He’s taught me a lot too. Eddie always had the time to teach me stuff about how the car works that my father didn’t have time to when he was racing. I definitely respect him. 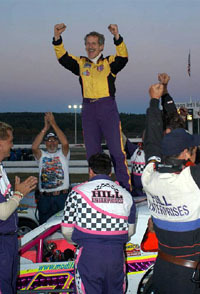 It was announced last week that Ted Christopher would drive for the Hillbilly team in the NASCAR Whelen Southern Modified Tour opener at Caraway Speedway. In the past, Christopher and Flemke have had several run-ins on the track. While the decision to put Christopher into the car didn’t help to strengthen the relationship of Flemke and his team, it wasn’t the reason for the divorce either. One of the races that Flemke won in the #79 was last year's Thompson 300. The Hills obviously don’t harbor any ill feelings towards Christopher either. But even if TC wasn’t the home wrecker, the question on how to handle the possibility of running more NASCAR Whelen Southern Modified Tour races might have caused some of the major problems between driver and team though. Flemke lives in Connecticut, where he runs Raceworks - a successful chassis building business, and the Hill team is located in central North Carolina. The choice to load up their schedule with races down South might have been good for the team, but not so great for Flemke. Having the Easter holiday take place on the same weekend of the Southern Mod opener at Caraway was another problem. The last race that Flemke ran in the #79 was at New Smyrna, where the team had a rough Florida Speedweeks. 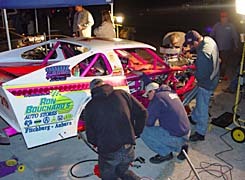 So now with only 17 days before the trailers are unloaded for the season-opening Icebreaker at Thompson, the focus for both the #79 team and Flemke is to get ready for an attack on the 2005 NASCAR Whelen Modified Tour championship. And there have been plenty of volunteers to help fill the seat in the #79. But fans might need to look at the door number of the car to know which one it is on opening day. One thing that Hill isn’t looking forward to is having to race against Flemke. Even though he turns 50 next month and has running the Tour since 1988, his best season has been his most recent one. Quitting isn’t an option for Flemke though. 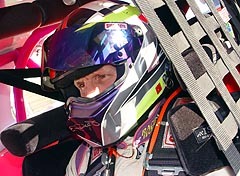 Speed51.com will have continuing coverage on the future plans for both Flemke and the #79 team in coming days. Flemke will be close to home this Easter. Flemke runs with the #18 of Donny Lia at New Smyrna.